As you may have heard, two big publishing houses have just announced plans to merge. As one combined entity, Random House and Penguin Books would become the largest publisher of consumer books in the world. Booknerds everywhere, myself included, started wondering what the new company might be called. Book House? Random Books? Penguin House? Igloo? I wondered about it on Twitter, and Catherine Fain, the super-stylish gal behind the fashion site, Southern Arrondissement, tweeted back. We hatched an idea! Someone in publishing: Do this. Love. Love. 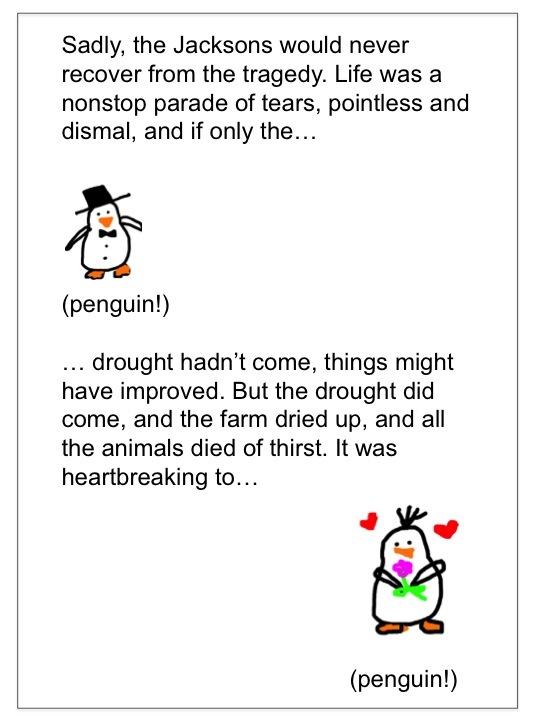 Love Random Penguins. Thank you! I can think of a few books I’ve read that might be improved with a penguin or two. Thanks.. you brought a “Random” giggle to my morning… apparently dorky works for me.. hey,,,maybe we name the penguin “Dorkie” ??? I mean, who doesn’t? Have you ever heard anyone say, “You know who’s a real jackass? That penguin.” Nope. I so desperately want them to do this. Just don’t let it become a penguins-in-your-pants situation. That’s taking it too far. Oh, you really do like penguins. Thanks! Buaha, so funny. I would be delighted to have my books occasionally interrupted by penguins!! Right? Everything’s better with penguins. 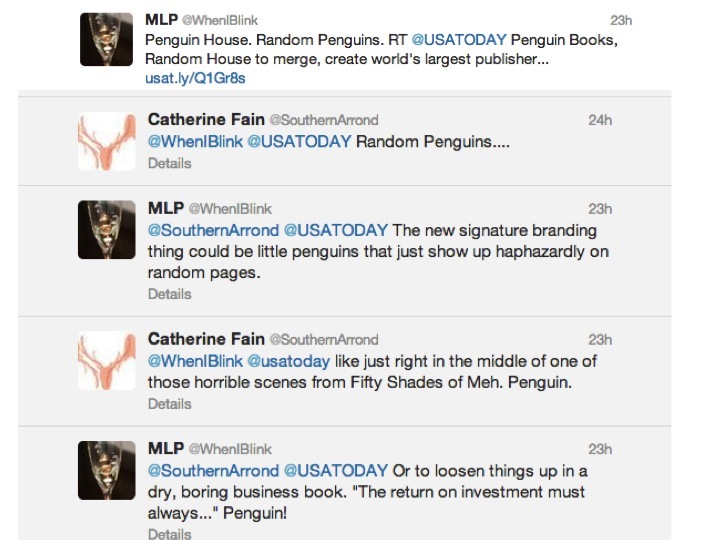 I would buy Random Penguin books just to play “hunt the Penguin”. Each book could come with a little highlighter shaped like a lasso. Then for every 25 you find, a discount on the next book you buy. I like this idea.